Wynton Marsalis and the Lincoln Center Jazz Orchestra were at the 2009 New Orleans Jazz Fest on Saturday the 25th of April. 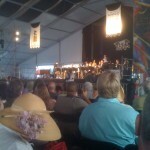 I was fortunate enough to get down to the Jazz Fest and hear the Lincoln Center Jazz Orchestra perform. They sounded absolutely great and the crowd really had a good time. Wynton Marsalis had a really good line up of a trumpet section as well. Ryan Kisor, Marcus Printup, and Sean Jones all took awesome trumpet solos. I was really impressed. Unfortunately I didn’t get the idea to start recording some of their trumpet solos with my iPhone until the end of the concert. I should’ve brought my video camera, but I wasn’t thinking. At the end of the show, Wynton Marsalis and the Lincoln Center Jazz Orchestra rhythm section did some G blues. It was a really simple solo, yet really swung, real authentic New Orleans style playing. I wish I could’ve recorded the whole trumpet solo, then I would’ve done a transcription. Sorry this was removed. Feel free to listen to more of Wynton Marsalis below.